After a long focused time of hard work, after writing, rewriting and editing I finally did it: published my first book. The book is about my experience of going through breast cancer. En Garde is a good guide for reducing stress in times of fear and anxiety. And who doesn’t have those emotions for various reasons at some time in our lives? The lesson of the book is that the mind is an incredibly powerful tool that can help overcome difficult times. The mind can provide a way out of painful situations no matter what the cause of those fears and anxieties may be. Who could ever imagine that the hero of my true story would be an imaginary British gentleman, only six inches tall, who was my rock of strength and had the power that defeated the “Big C?” It is quite a remarkable story. I’m sure everyone will want to know about Percy Puddlethorpe. Now the real problem is at hand: spreading the word. I know about it, now you know about it, but how can I get the rest of the world to know about it? post to those on your email list. This is a book that can help many people, but first it has to get to them. Will you help me tell those that you know? Everyone knows someone who has or had breast cancer. If they could read my experience they will be stronger for it and they will be armed to help themselves. 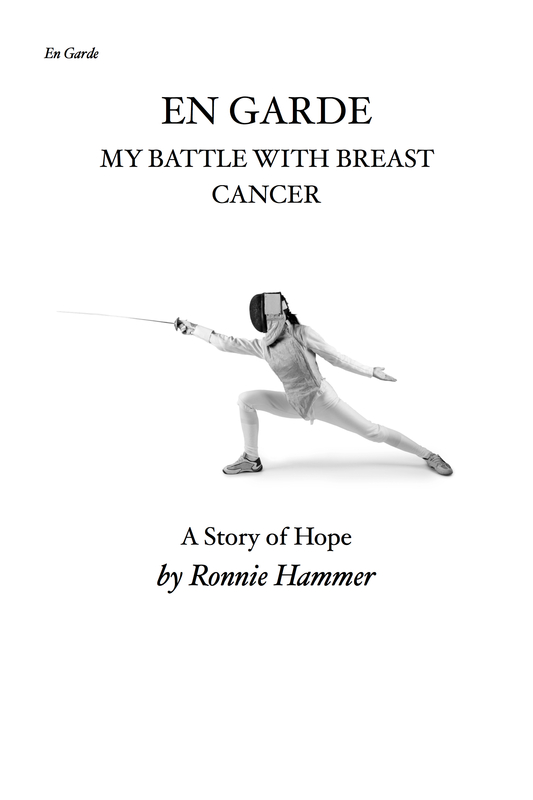 My book is “En Garde, My Battle With Breast Cancer,” by Ronnie Hammer. It is available world wide at http://www.amazon.com. If you each would forward this blog to those on your email list many more people will know that this book could help them. Thank you for your help, and I wish you all a healthy, wonderful year. There are a few things you don’t know about me. Things that happened before we met; things that happened before I started blogging. I had cancer: breast cancer. It was discovered on a routine mammogram. That was an enormous, unexpected shock, especially since I had recently had an annual exam telling that everything was normal. One month it’s normal and two months later you’re diagnosed with cancer; how bizarre! Out of this terrible experience a fascinating, effective technique evolved that I want to share with you. You all know how much I love corresponding through our mutual blogs; I’ve been blogging for three years and feel friendship with people I will never know in person: my cyber-friends. I enjoy being involved with all of you. So being isolated was hard for me. I was so alone during the treatments and felt the need for someone to be next to me and reassure me. So I used a technique I learned called visualization. This amazing technique assured me I would always have a friend nearby. This friend would accompany me to my appointments and treatments. My visualization made it possible to always have this supportive being right by. It worked so well for me that I frequently talked about it. I shared my story with others who were suffering. They tried it too and told how much comfort they found in it. They encouraged me to write the story and share it. And that’s what I have done. I wrote a book which was just published and is available on amazon.com. It’s called, “En Garde, My Battle With Breast Cancer.” It is available on amazon.com. This story will educate people who know as little as I did about what was in store for them during the treatments. Being uninformed is more frightening than knowing what to expect and being prepared. I know that this book will be of service to those who read it. Please try it, give it to someone you know who is facing a hard time, and please let me know if you thought it was helpful. This is a Thanksgiving for which I have much to be thankful. I wish you all good health and loving presences nearby.